New Zealand’s hard-working farm dogs are worth gold to their owners, who often give them affectionate names such as Girlie, Fly, Stride, Beaut and Loyal. These huntaways, beardies and other purpose-bred herders muster thousands of sheep and cattle across hill and high country – a tough job that can’t be done any other way. What do farm dogs do? 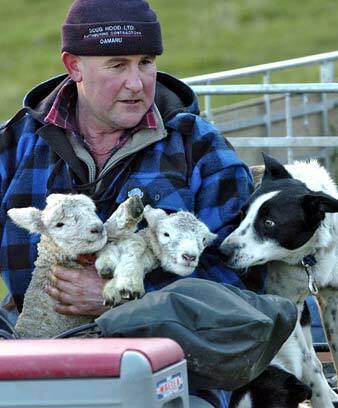 New Zealand’s 200,000 working dogs play a vital part in sheep and beef farming. They round up sheep and cattle, which have to be moved across huge areas of hill and high country. They also help to move stock through gates, into pens and onto trucks. Sometimes they separate the animals into groups, or catch one that has run away. Huntaways. Usually black and tan, the big, strong huntaway is bred for its loud, deep bark. New Zealand heading dog. These are mainly black and white. They are fast, and control stock by staying close to them. Dogs usually work in a team – for instance, one heading dog and two or three huntaways. Farmers prefer dogs that are black with white or tan, as these colours are easier to see in the distance than solid black. White dogs look too much like sheep, and may frighten sheep. catching: holding a lamb down without biting. Farm dogs must also be tough, and very fit. Working in all weathers, they may run 60–100 kilometres a day – often at 20–30 kilometres per hour. ‘Get in behind’ – move beside the handler and wait. They also learn to follow commands that are blown on a whistle. A good farm dog has a close bond with its handler. Often the dog knows what to do, but it must also obey the handler. These popular competitions test the skill of dogs and handlers. In one event the dog has to move some sheep from a distant hill, in a straight line and into a marked circle on flat land – in just 14 minutes.